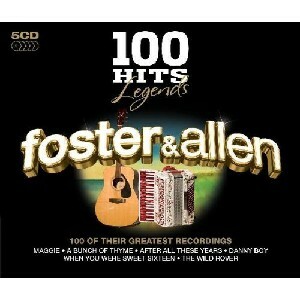 100 Hits Legends - Foster And Allen, The Scottish Music Shop - The Best Selection of Scottish CDs and Scottish DVDs. Launched in October 2007 100 Hits has sold over 1.8 million units so far. The label continues to go from strength to strength delivering not only great value, but quality tracks from a number of artists. Striking, contemporary packaging including embossed slipcase and artist biography. The 100 Hits Legends range features classics from The Rat Pack, Andy Williams, Dean Martin, Doris Day, Ella Fitzgerald, Perry Como, Foster & Allen, Glenn Miller, Nat King Cole and Frank Sinatra.